The Applications screen contains several handy functions, each of which are described on their own page. Click each of the buttons to be taken to the appropriate function page. The [eMail today's debug/log files] button will open up your default email client, and will compose a message to support@Ross-Tech.com with all of the log files and debug files with the current date. 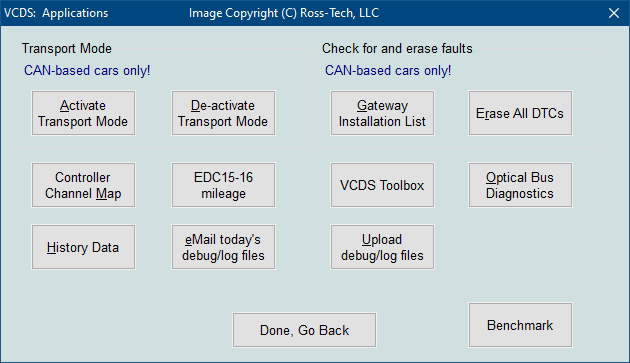 The [Upload debug/log files] button will open up your default browser to a special page that allows you upload files and email them to support@Ross-Tech.com even if you do not have an email client installed. Use [Done, Go Back] to return to the Main screen.